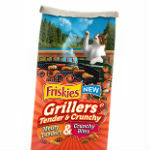 Get a free bag of Friskies Grillers. Fill out the request form to get a free coupon of Friskies Grillers. my cats are climbing the curtains waiting for this food!!!!!!!!!!! !